The National Youth Brass Band of Great Britain is delighted to announce that Bramwell Tovey (NYBBGB Artistic Director) has invited “The President’s Own” United States Marine Band Assistant Director of Music Major Michelle Rakers to be the Guest Conductor for the 2014 NYBBGB Summer Course. The course takes place at Wymondham College, Norfolk from Saturday 2nd August to Saturday 9th August. 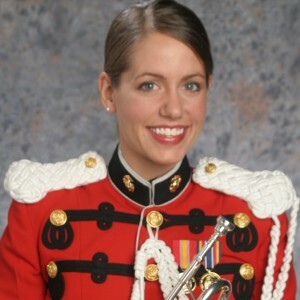 With equal excitement Bramwell Tovey has invited “The President’s Own” United States Marine Band Cornet and Trumpet Soloist Staff Sergeant Amy McCabe to be the Guest Soloist for the Summer Course. Bramwell Tovey and the NYBBGB are delighted that both these superb musicians from Washington D.C. have accepted his invitation. Michelle and Amy will be the latest in a ever growing list of world class musicians from North America who have been engaged by the NYBBGB in recent years. Joseph Alessi, principal trombone of the New York Philharmonic, Jens Lindemann, former lead trumpet with Canadian Brass and Andrew McCandless, principal trumpet with the Toronto Symphony have all appeared with the NYBBGB since 2006. The end of course concerts will take place at Beccles Parish Church (Beccles is the home of NYBBGB President and former Artistic Director, Elgar Howarth) on Friday 8th August and Regent Hall, London on Saturday 9th August. NYBBGB Artistic Director Bramwell Tovey has directed 13 of the 17 courses since he took up the position with the NYBBGB in 2006, but is unable to conduct this coming Summer Course as he will be making his conducting debut with the world renowned Chicago Symphony Orchestra in the USA. Following the Summer Course The National Youth Brass Band of Great Britain will be performing a major concert at The Great Northern Brass Arts Festival at The Bridgewater Hall in Manchester on Saturday 13th September. Bramwell Tovey will be travelling from Canada specially to conduct the NYBBGB for this concert. Assistant Director Major Michelle A. Rakers joined “The President’s Own” United States Marine Band in May 1998 as a trumpeter/cornetist. 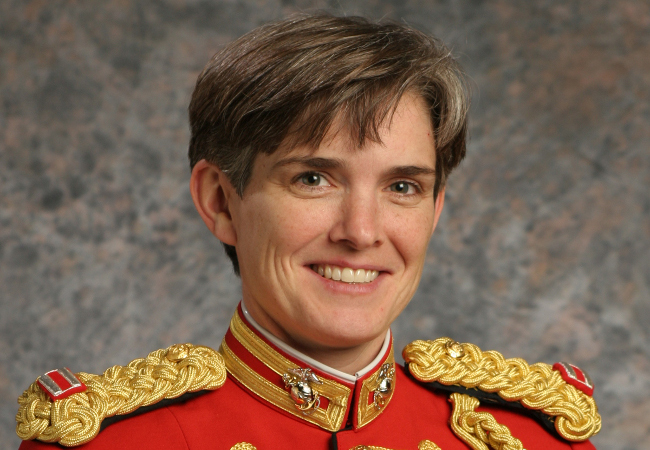 She was appointed Assistant Director and commissioned a first lieutenant in July 2004 and promoted to the rank of Captain by the Commandant of the Marine Corps General Michael W. Hagee on January 1st 2006. She is both the first female Assistant Director and first female commissioned officer in the history of “The President’s Own”. Earlier this month Michelle A. Rakers was promoted to the rank of Major. With the Marine Band, Major Rakers has performed at the White House, in the Washington, D.C. metropolitan area, and across the country during the band’s annual concert tour. She has served as a conductor and coordinator for the fall and winter Chamber Music Series, and was nominated for her current position in 2003. On June 13, 2004 she conducted her first band concert, at the U.S. Capitol. Major Rakers, a 1986 graduate of the Marian Heights Academy in Ferdinand, Ind., received a bachelor’s degree in music management from the University of Evansville in Indiana in 1990. She continued her studies at Northwestern University in Evanston, Ill., where she earned a master’s degree in music performance in 1991. She is currently pursuing a doctorate from the Peabody Conservatory of the Johns Hopkins University where she is studying with Harlan Parker. Her trumpet instructors include James Bursen of the University of Evansville, Vincent Cichowicz of Northwestern University and Chris Gekker from the Aspen Music Festival in Colorado. Her conducting instructors include Mallory Thompson of Northwestern University and Kate Tamarkin of The Catholic University of America in Washington, D.C. In 2005, she received the University of Evansville’s Distinguished Alumni Award and was granted an honorary induction into Tau Beta Sigma, a national music sorority. Prior to joining “The Pre sident’s Own”, Major Rakers performed with the Kalamazoo Symphony in Michigan and the Evansville Philharmonic in Indiana. with the Chicago Civic Orchestra, the Spoleto Festival USA Orchestra in Charleston, S.C., and the Walt Disney World All-Star Collegiate Jazz Band and Christmas Brass in Orlando, Fla. She also received the Roger Voisin Trumpet Award while a fellow at the Tanglewood Music Center in Lenox, Mass. She was featured as cornet soloist in William Bolcom’s First Symphony for Band on the Marine Band’s 2011 educational recording “Flourishes and Meditations on a Renaissance Theme”.